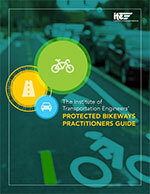 The Institute of Transportation Engineers' Protected Bikeways Practitioners Guide (Guide) is intended to provide transportation professionals with an easy-to-navigate document for planning, designing, operating, and implementing protected bikeways in the United States and Canada. The Guide provides references to the critical design standards and guidelines in these two countries that direct the geometric and operational design of protected bikeways, including international best practices and research, and fills current gaps in guidance based on best practice examples. While primarily focused on application in the United States and Canada, we also believe the guidance will be useful for protected bikeway projects in other countries. The production of this Guide has been unique for ITE. It was built based on a supporting Lecture Series that brought together leading practitioners from across North America to deliver six lectures. The content they presented has been used as the primary basis of the Guide. The presentations and recordings of the lectures are available to transportation professionals from ITE's Learning Hub as a further aid as they create and transform their cities to be safer, healthier, and more equitable. We highly recommend viewing these lectures on demand. We would like to thank the lecturers for their contributions to this Guide and for providing valuable support to the transportation profession. Note: A PDF version of this publication is also available.